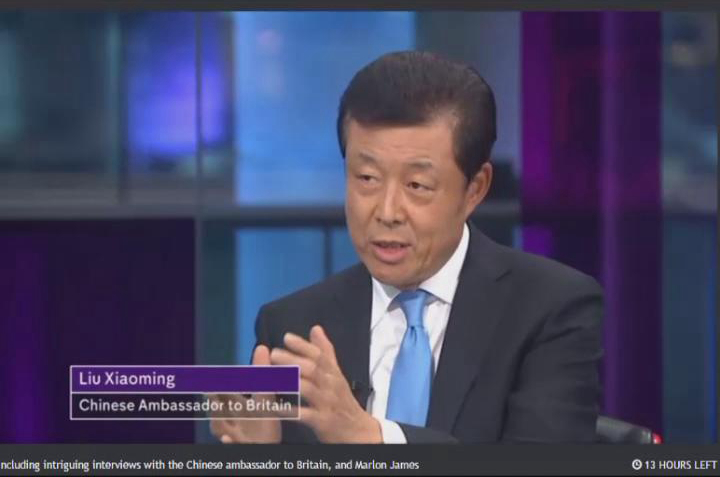 Jon Snow: I'm joined now by China's Ambassador to Britain, Liu Xiaoming. And he is with us right now. The President, President Xi Jinping is coming all the way to the middle ranking European nation and nowhere else, and then going home. What's he hoped to get from Britain, Ambassador? 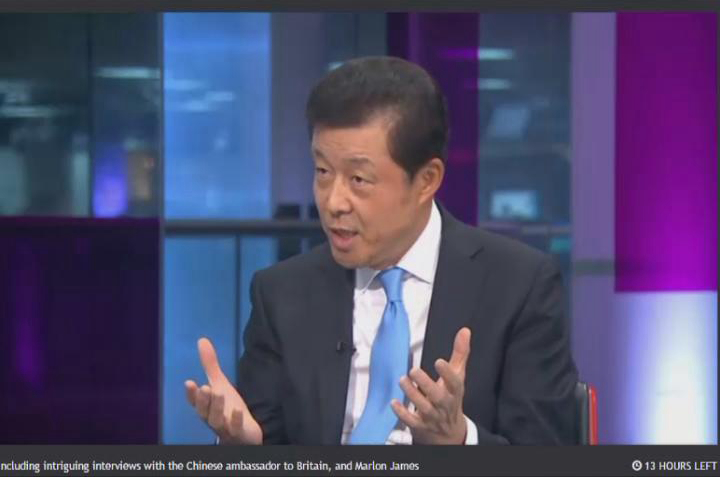 Liu: He will be here for promoting relations between China and the UK. You regard UK as a middle ranking country. We do not think this way. We still believe the UK is a country with global influence. It's one of the powerhouses, and China and the UK have a lot to cooperate. The UK now is China's second largest trading partner within the EU, China is the UK's second largest trading partner outside Europe, and UK is the largest recipient of Chinese investment. So in the past three years, China's investment is booming here in the UK. Joe: But the backdrop in China is not an easy one: a 20% reduction in imports and of course this catastrophic fall in the stock market. Will the President be able to say that's all behind us now? Liu: When you look at China's economy, you have to focus on the big picture. You have to see China's economy in the long-term view. I think fundamentally and basically China's economy is still sound and good. For the first half of this year, the growth rate of the Chinese economy is 7%. China is still a leading country in the world, in terms of the growth of its economy. Jon: But don't you think these events have talked to us about a degree of tension between the idea of a Communist state and a free market economy. Can you really have that marriage? Jon: But nobody could elect a non-Communist Party to run China. Liu: But the Communist Party provides a strong leadership and enjoys the people's support. The people support the Communist Party as their leader to lead China from poverty to prosperity. So why should we rock the boat? And you just look at the past 30 years, China, you know, turning from a relatively poor country to the second largest economy. It's a miracle. Jon: So do you think Britain has talked too much about the human rights in China? Do you think they have stopped talking about human rights in China? Liu: I think we can talk about human rights. No country is perfect. But I think from your earlier video clips you gave the impression that once you talk about human rights in China, you always talk about the negative side of China. No country is perfect. When you talk about human rights, you have to have a comprehensive view. What are the human rights? I think people have a right to a better life, a better education, a better job. I think everyone would agree that Chinese people live better, live longer. They enjoy their lives. Jon: But the things which exercise people are executions and detentions. And there are detentions of very large numbers of people. Liu: Very large numbers of people? Your video clips talk about 100 people. You have to remember China's population is 1.3 billion. Jon: It might be rather more than 100 people. Jon: But they've all been tried. Liu: They've all been tried through normal legal process. China is a country ruled by law. For those people who violate the law they have to be held accountable. So that's, you know, all countries ruled by law have to respect the law. We might be different with regard to how countries are run, but I think we agree that country should be governed by the rule of law. Jon: Have you been to the Royal Academy to see Ai Weiwei's art exhibition? Jon: But he is the most famous Chinese artist in the world. Liu: I don't think so. Jon: Why do you bother with him? Why is he a problem? Jon: But do you have a problem with him? Liu: I don't have a problem with him. Jon: Then the Chinese state has a problem with him. Liu: The problem is he was under investigation because of a fraud of accounting. He's been denied exit. But now he can come out and put up his exhibition. That shows how free China is. Jon: Let me ask you a final question. The new Labour leader, Jeremy Corbyn, has attacked China's free market philosophy, particularly regarding what happened to the victims of the fire in which a lot of firemen died and a lot of workers died. He specifically blamed China's free market for that disaster. Are you disappointed in this new apparently left-wing leader of the Party? Liu: In fact, to share my latest encounter with him, I just had a meeting with him this afternoon. Jon: Oh, that's very interesting. Liu: To prepare for the meeting that he is going to have with the President. We talked quite a lot. We talked about the contributions made by the Labour Party to the development of China-UK relations. And we talked about the party to party exchanges, the Labour Party and the Communist Party. Jon: So the relation is good. Liu: The relation is good. You know, the incident you are talking about is a bad incident. It's a tragedy. And the Chinese Government also investigates this. Those who will be held accountable will be punished, will be put behind bars. There is no mercy about that. Jon: Thank you very, very much. 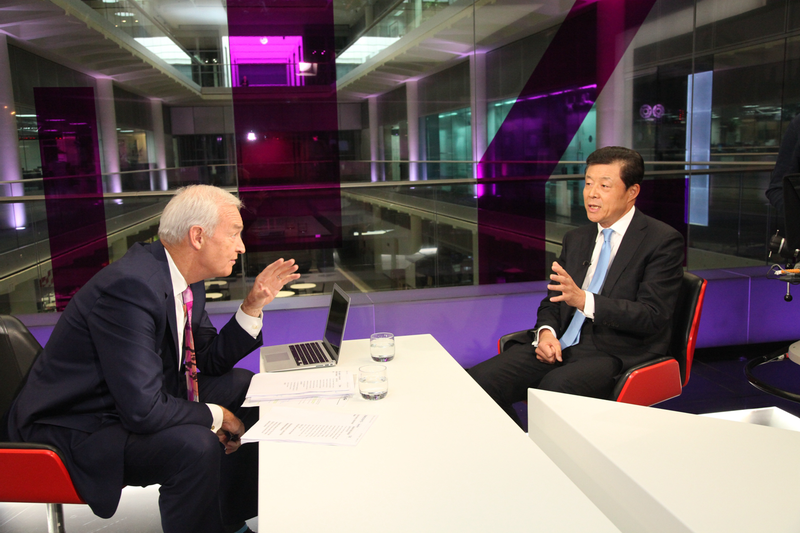 Channel 4 News is a flagship news programme of Channel 4,the third largest public television broadcaster in Britain. It is known for its international coverage and in-depth interviews, and has an audience of more than one million. Joe Snow is senior presenter of Channel 4, having served at the broadcaster for nearly 30 years.